M833 is a unique high-aperture double dispersive monochromator-spectrograph whose compact design combines high spectral resolution intrinsic for long-focus instruments and extremely low stray light which is an essential requirement for Raman spectroscopy, as well as for any other low-light-level applications. Extremely low stray light allows the multi-element detector to simultaneously acquire both Stokes and Anti-Stokes components at the distance up to 20 cm-1 from the excitation line (1200 l/mm gratings) without using any Notch or Edge-filters. The compact long-focus instrument (f=833mm) with the unique high aperture (F# 1:5.5) enables solving tasks, that demand high spectral resolution, yet occupies little space in your laboratory and, furthermore, is mobile. The M833i in the Imaging mode provides absolute astigmatism compensation and high spatial resolution along the exit slit, meanwhile preserving the ideal line quality. Three pairs of gratings (number of lines per mm and blaze wavelength are tailored to the Customer’s requirements) are supplied in a standard set and ensure the widest range of applications. Two input and two output ports can be completed with the full set of accessories manufactured by SOLAR LS: standard and crossed entrance slits, order separating filter wheels, aperture matching units and optical fibers, CCD detectors and adapters for them. Full computer control: slits, diffraction grating turrets and filter wheels, input/output port switching is controlled by the intelligent and easy-to-use software. The SolarLS.LAB software provides automated control over the M833 and its detectors. It allows stitching spectra obtained by several diffraction grating scans in order to get a panoramic spectrum. Many possibilities of spectra processing and analysis are provided as well. At your request, DLL and/or VI program modules are supplied for controlling the instrument via the customised software or LabVIEW. The M833 comprises either one or two input and output ports. Input port may hold either a standard entrance slit, or a crossed entrance slit (optionally). All the spectral slits are automated; their width is adjusted by the instrument software. The slit design also contains a microscrew, which provides the possibility to manually adjust the opening width of the slit knives. The standard M833 version comprises three pairs of diffraction gratings mounted on two turrets. Since the M833 implements separate control for scanning and grating changing, each diffraction grating, when scanning the spectrum, rotates around an axis passing through its center. This allows to bring your real optical system close to the initial optical design and to provide its highest optical quality. The standard optics comprises spherical and flat mirrors with Al+MgF2 coating optimized for high UV efficiency. Optionally the M833 may contain optics with Al+SiO2 or gold coating for high efficiency in the infrared spectral range. 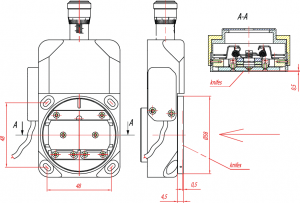 The M833 output ports may hold either two exit slits, or one exit slit and detector, or two detectors concurrently. The M833 exit slit has 4 mounting holes M2.5 that allow you fixing your own detector to the slit housing, if necessary. 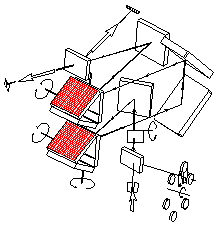 Location of mounting holes is shown in the figure below. Note: To avoid a breakdown of the slit mechanism it is prohibited to fix any units weighing more than 1 kg to the slit housing! 1) A set of installed diffraction gratings is confirmed while placing the order. Upon your request, diffraction gratings with another number of grooves per mm and another blaze wavelength can be used. 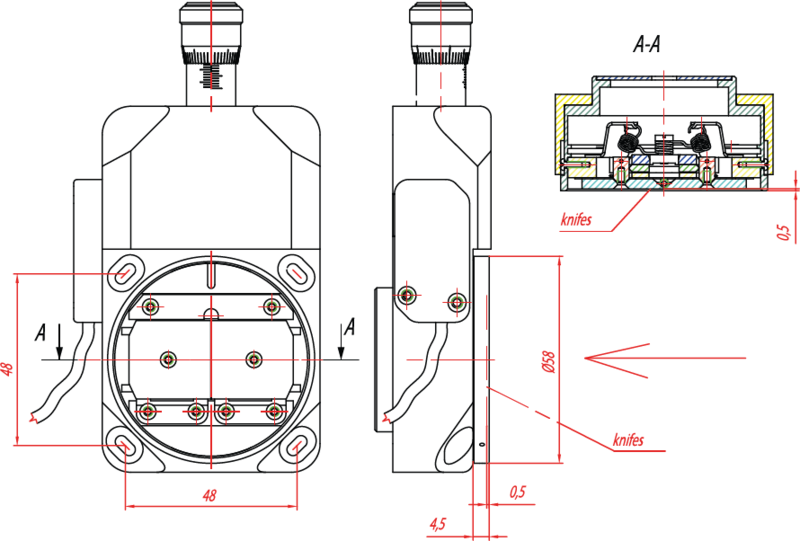 5) For detector with 25 um pixel size and 12.8 mm (resolution is 2.5 pixels). 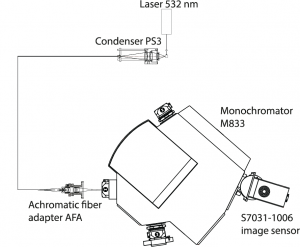 The M833 monochromator-spectrograph has a wide range of options and accessories that provide efficient light collection from the sample located at a finite distance and at infinity, delivering light to the monochromator with and without an optical fiber, effective aperture matching of the optical fiber and monochromator. All exit slits are equipped with precision focusing devices; and detector adapters allow easy detector focusing. 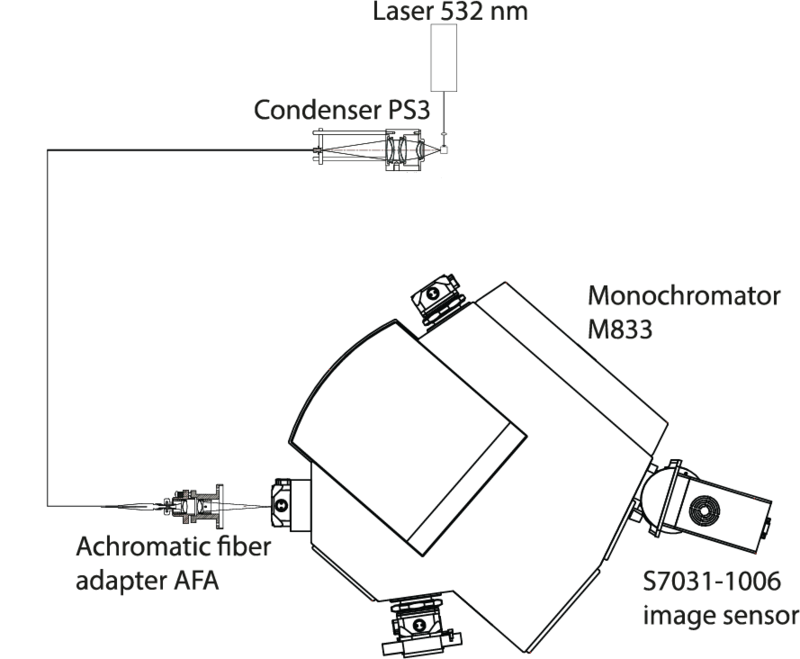 The detector adapter of the long-focus M833 monochromator-spectrograph allows changing the slope of detector plane relative to the optical bench. 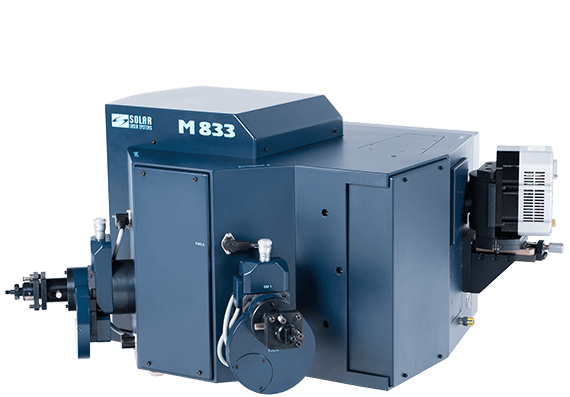 The M833 is a unique double dispersive monochromator-spectrograph consisting of two Czerny-Turner monochromators. Its key difference from any conventional double monochromator is that the M833 features the 30mmx10mm flat field and allows attaching not only a single detector (PMT), but also a multichannel array for simultaneous detection of a wide spectrum range. 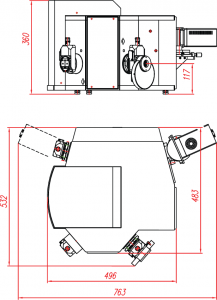 This feature is implemented by replacing the camera mirror of the first monochromator and the collimator mirror of the second monochromator with a specially designed optical matching system. Provides an optical coupling between the two monochromators-spectrographs located one above the other in a two-level optical design. 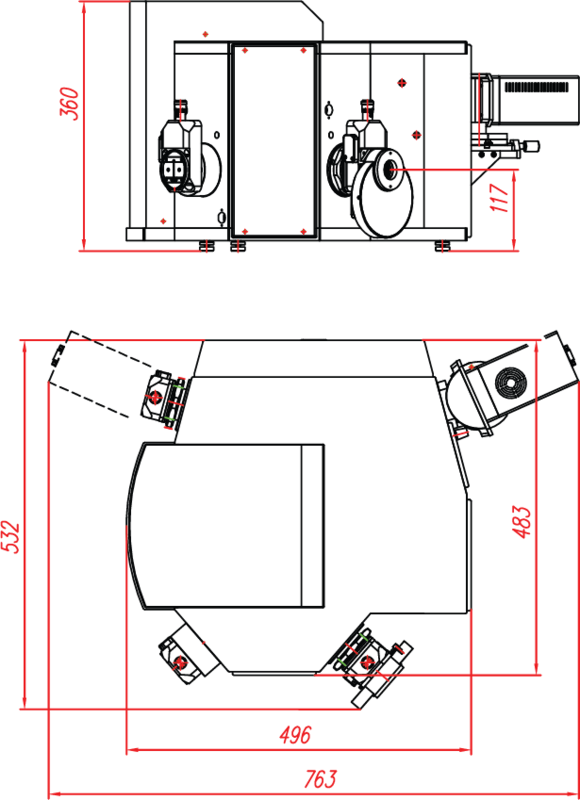 Thus, we achieve compactness and mobility of the long-focus monochromator-spectrograph M833. Ensures the complete coma compensation for any wavelength in the center of the exit slit (or in the center of a multichannel array). As a result the M833 does not have the spectral region of primary coma compensation. The M833 demonstrates its unique spectral resolution and high spectral line quality for any wavelength within the spectral range of gratings diffraction efficiency. The M833 optical layout and design completely exclude the possibility of re-reflections in specified spectral regions of the device operation, and reduce stray light by two orders of magnitude as compared to single monochromators having similar dispersion/focal length. Astigmatism compensation (IMAGING option) is a frequently used and popular M833 option. In case of the fiber input the IMAGING allows to effectively collect Raman signal to a height-limited detector. The M833 astigmatism compensator is a cylindrical mirror installed at the output of the M833 optical bench instead of a flat swinging mirror directing light to the lateral (radial) port. Thus, astigmatism is usually compensated at the lateral output port of the M833, while the axial port configuration remains standard. 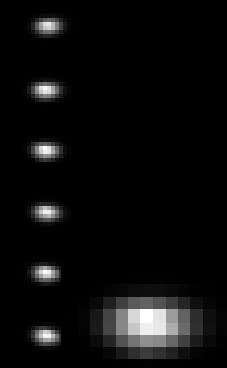 In general, astigmatism is common to all spectral instruments; this is a phenomenon when the point on the entrance slit is displayed as a vertical segment in the image plane. The M833 astigmatic segment is 7.7mm in the center of the flat field, and respectively 7.4mm and 8.2mm at the edges of the field. Astigmatism does not usually impair the instrument resolution, but, depending on the height of the detector used, can affect the overall sensitivity of the system. Astigmatism correction is imperative in the multichannel spectroscopy, in case you need to adequately convey the illumination distribution along the slit, as well as when using spectrographs with multichannel arrays in the 2D-image mode (Imaging). 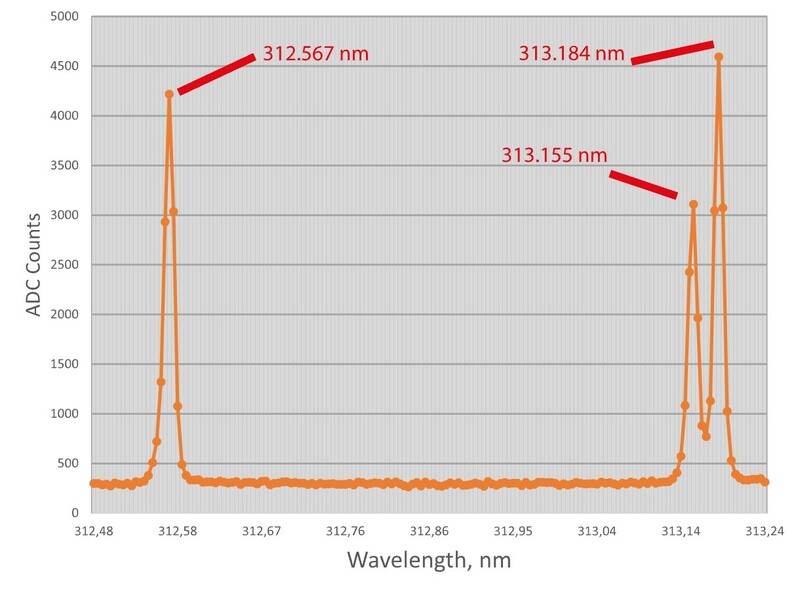 Raman scattering spectra obtained with M833i (with 1200 l/mm diffraction gratings, with 532 nm 10 mW excitation single-mode laser) demonstrate high capabilities of the device. Spectra were registered with cooled image sensor Hamamatsu S7031-1006 (pixel size 24 x 24 µm, sensor size 24.6 x 1.4 mm, ADC 16 bit, cooling -100°C) in Binning mode. The set-up for registration of Raman scattering is shown in Figure 3. Figure 1. Raman scattering spectrum for paratellurite crystal TeO2. М833 is a unique spectrograph that allows to view on the CCD both Stokes and anti-Stokes lines at 20 cm-1 apart from the excitation line. Figure 2. 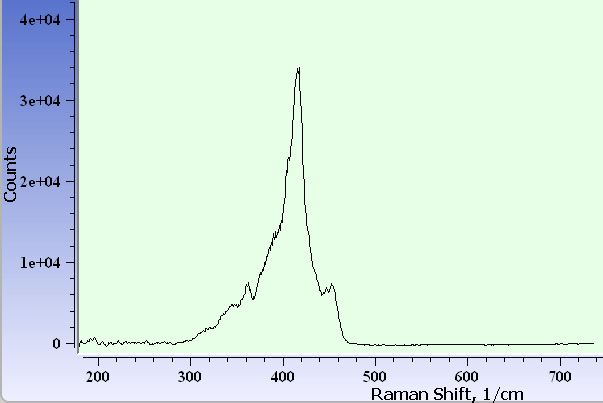 Raman scattering spectrum for the single acrylic fiber. Representative peaks are obtained with range 300..480 cm-1 with maximum at 405 cm-1. Figure 3. The set-up for registration of Raman scattering with M833. The registration was carried out at 90° to the excitation beam. The wide-aperture condenser PS-3, an optical fiber with a diameter of 600 μm and an achromatic AFA adapter to match the apertures of the optical fiber and the monochromator – formed the light collecting system. Reciprocal linear dispersion, multichannel array bandpass and spectral resolution depending on the selected diffraction grating, wavelength and detector properties. Here you can calculate the estimated values of reciprocal linear dispersion, multichannel array bandpass and spectral resolution depending on the selected diffraction grating, wavelength and detector properties.